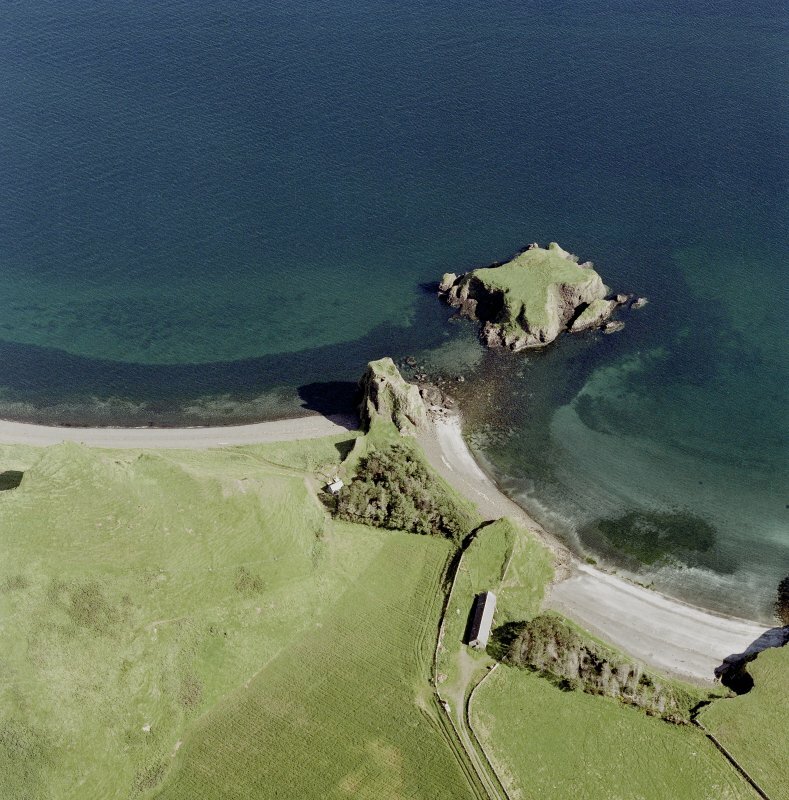 Canna, Coroghan (Coroghon) Castle, Alman and An Coroghan (Coroghon Barn): aerial view of various sites. 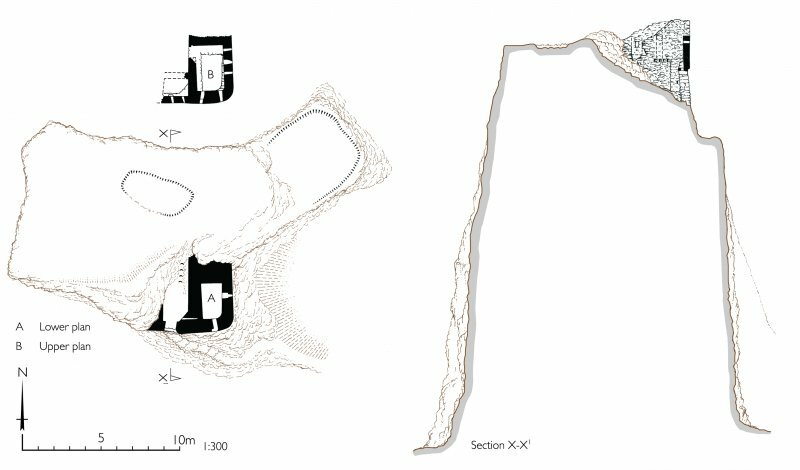 Plan and section of Coroghan Castle. HES publication illustration. HES publication illustration, 400dpi copy of GV006093. 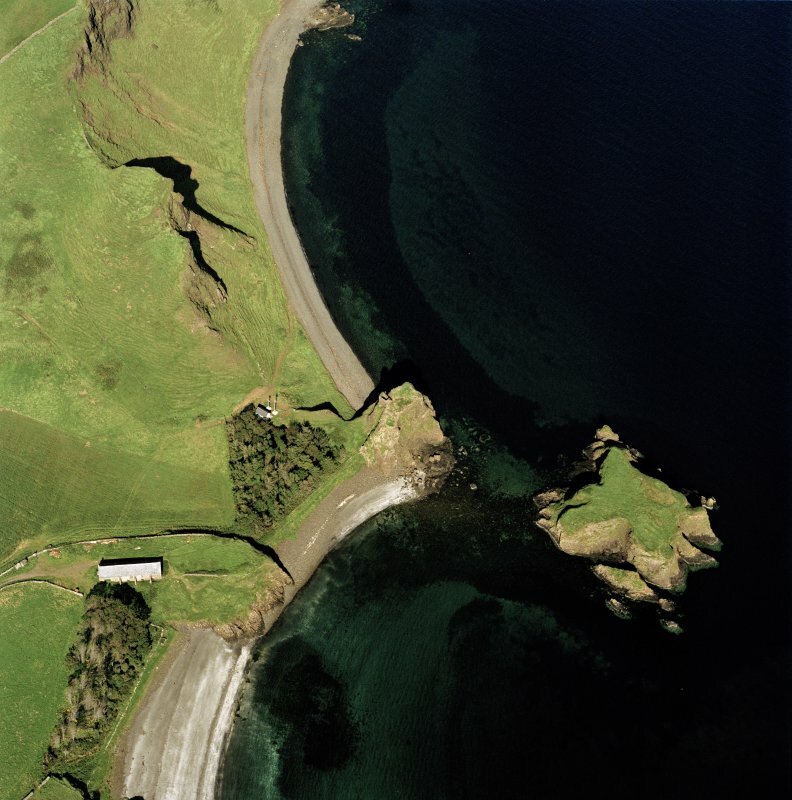 Canna, Coroghan Mor and Rhum. 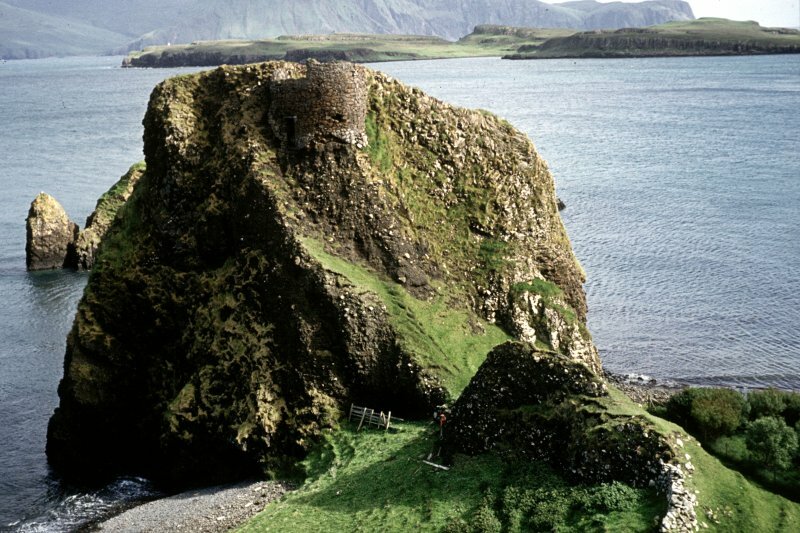 Coroghon Castle, Canna. The approach from the south east. The Coroghon Mor. General view from the west. The Coroghon Mor. 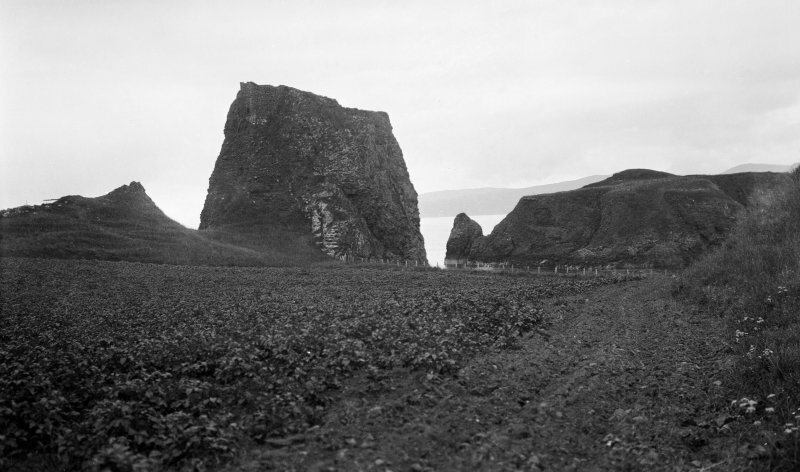 General view from the south east. 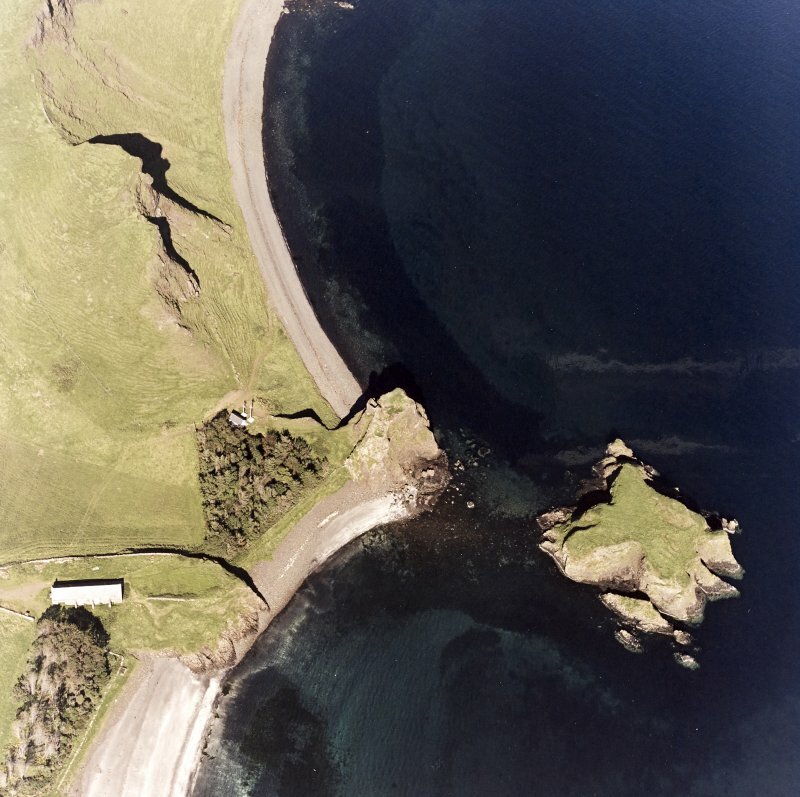 Oblique aerial view of Coroghan Castle and the pier on Canna, taken from the ESE. 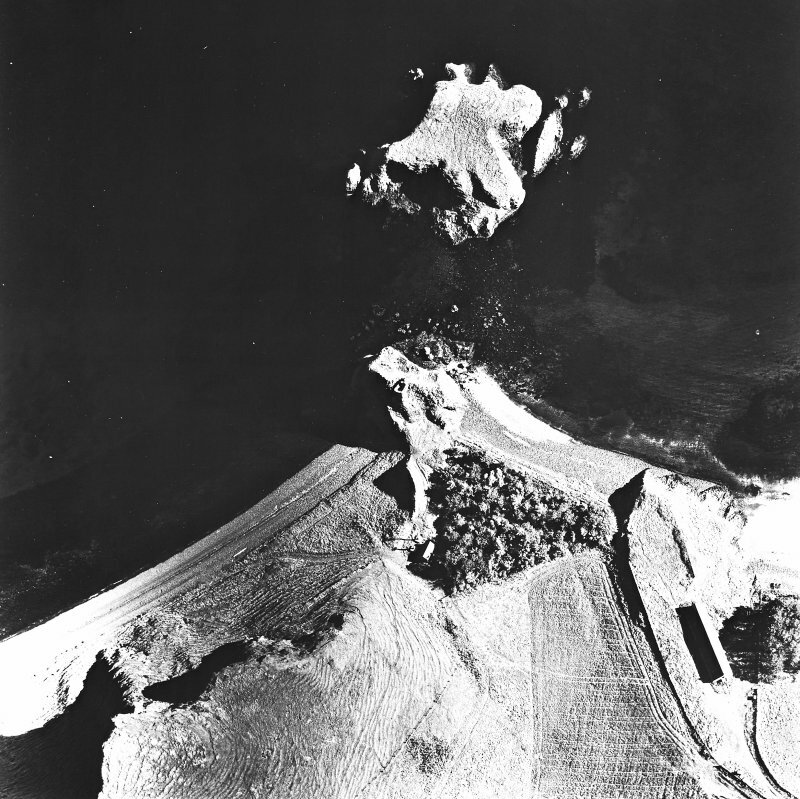 Canna, Coroghan (Coroghon) Castle and Alman: aerial view of various sites. 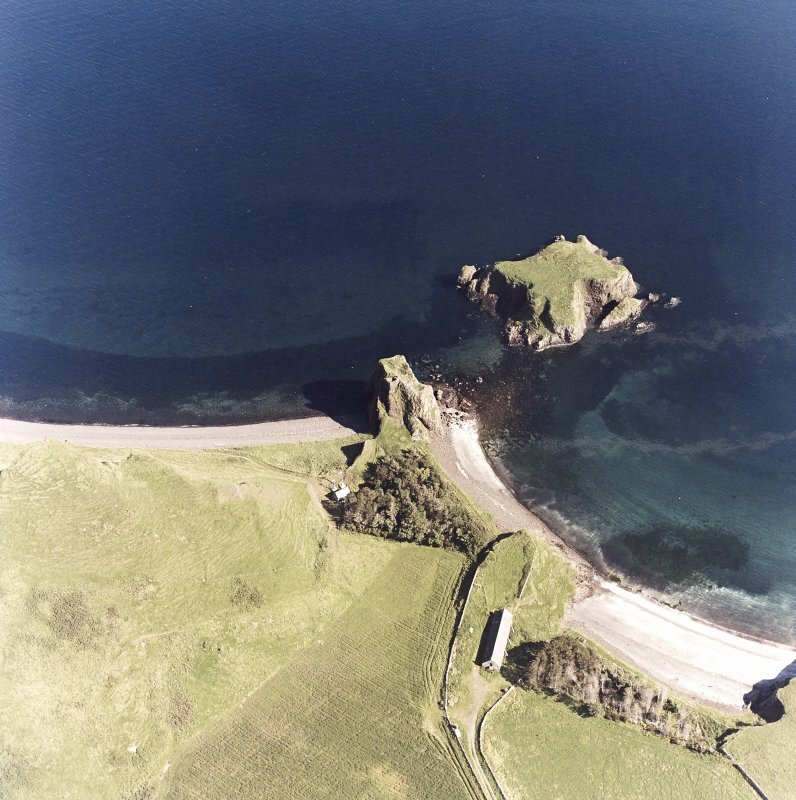 Oblique aerial view of Coroghan Castle and the pier on Canna, taken from the ENE. 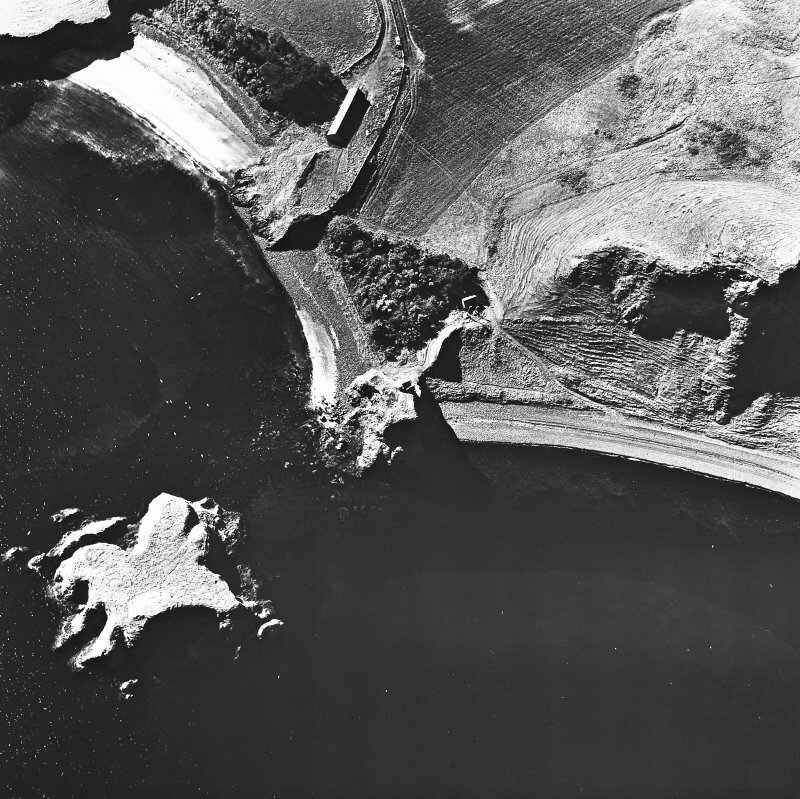 Scanned image of Canna. 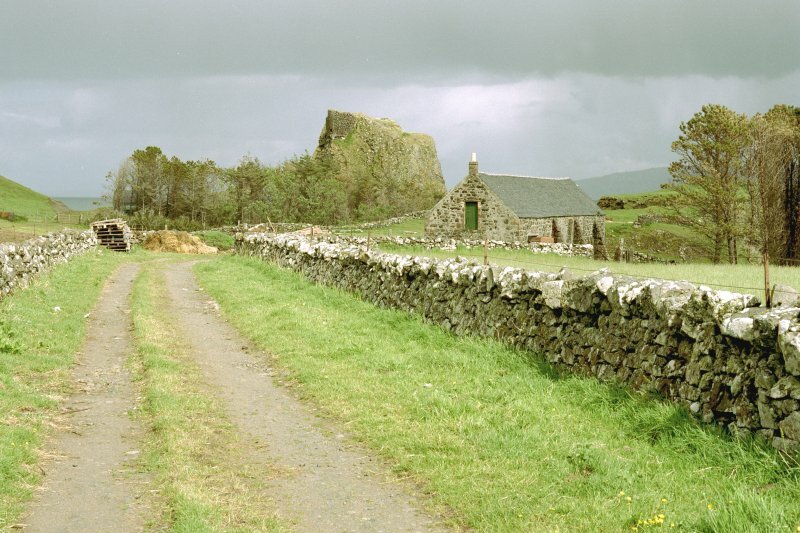 View of Coroghon Barn (An Coroghan) and Castle. 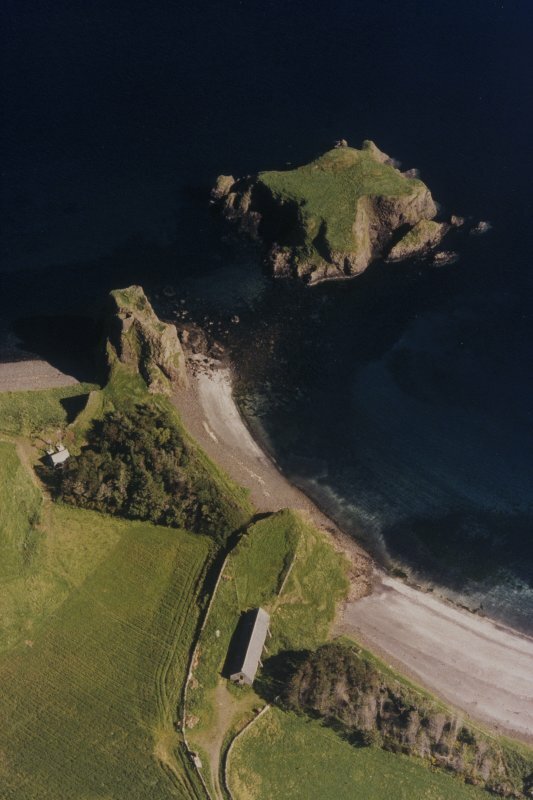 Area comprising the farm and laird's house at the east end of the island. 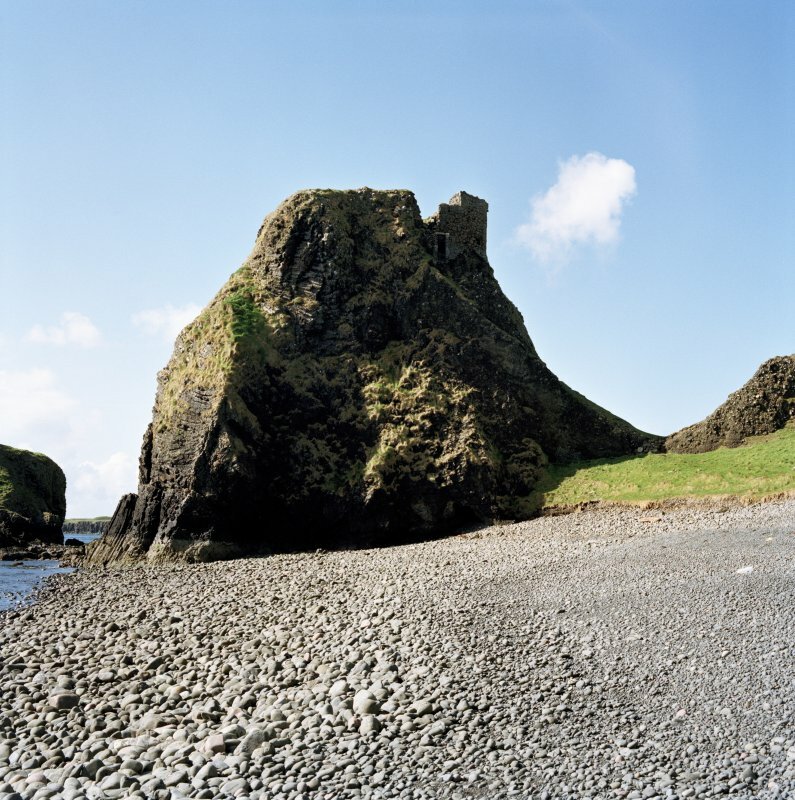 An Coroghon, probably 17th century Remains of a tower on a flat-topped stack, a place of refuge later used as a prison. 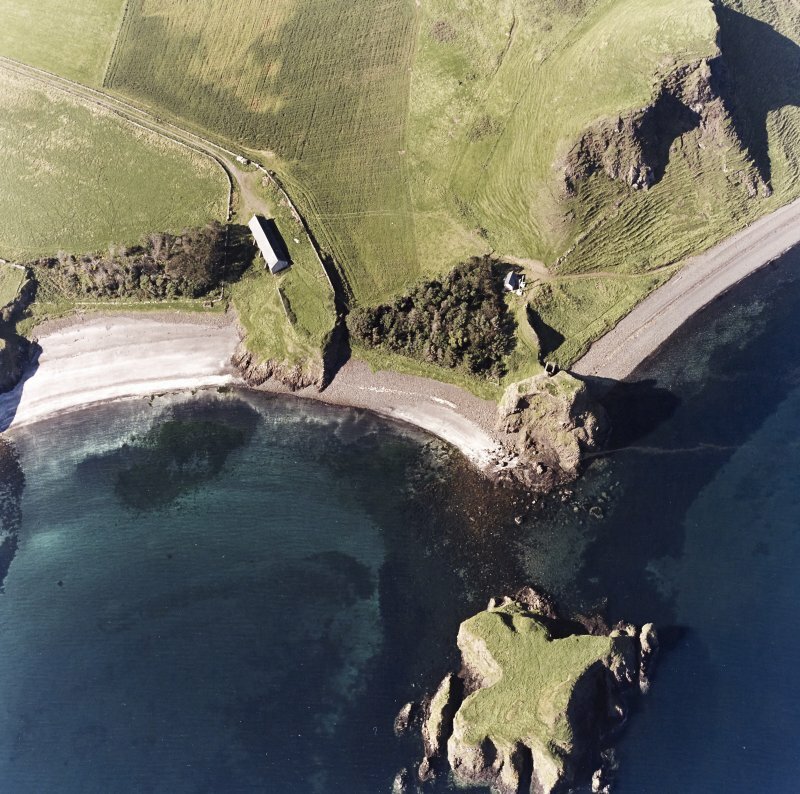 It was described by Pennant in 1772 as '... a lofty slender rock, that juts into the sea: on one side is a little tower, at a vast height above us, accessible by a narrow and horrible path: it seems so small as scarce to be able to contain half a dozen people'. A lintelled entrance survives in the mortared wall. (NG 2796 0552). 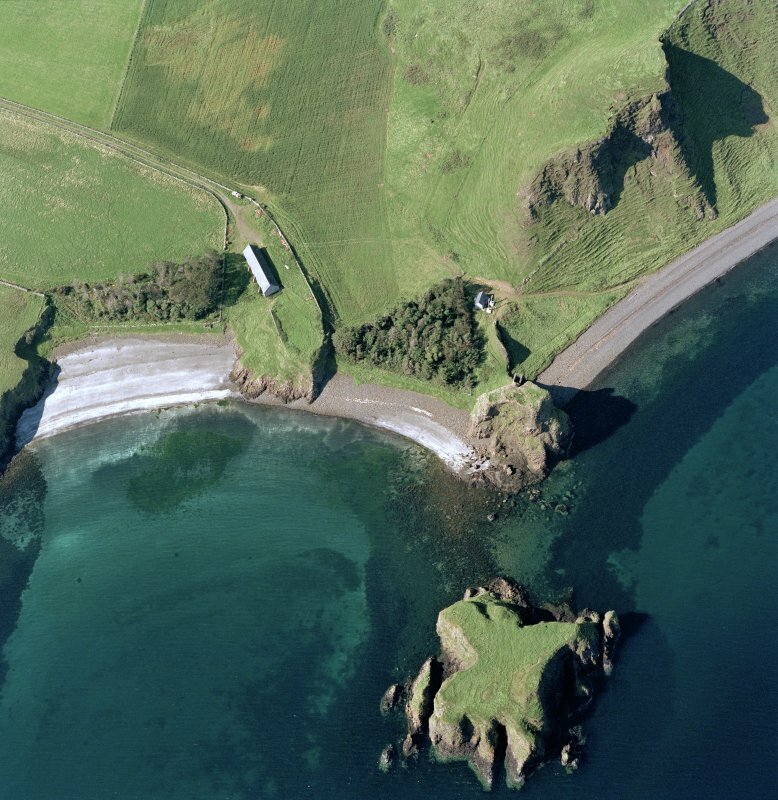 A 'castle' built on a stack (Coroghon Mor) rising 70-80ft sheer above the sea on three sides and linked to the land by a narrow neck, where ascent of the stack is possible by a track which leads upwards to a roughly rectangular forework of at least two storeys. 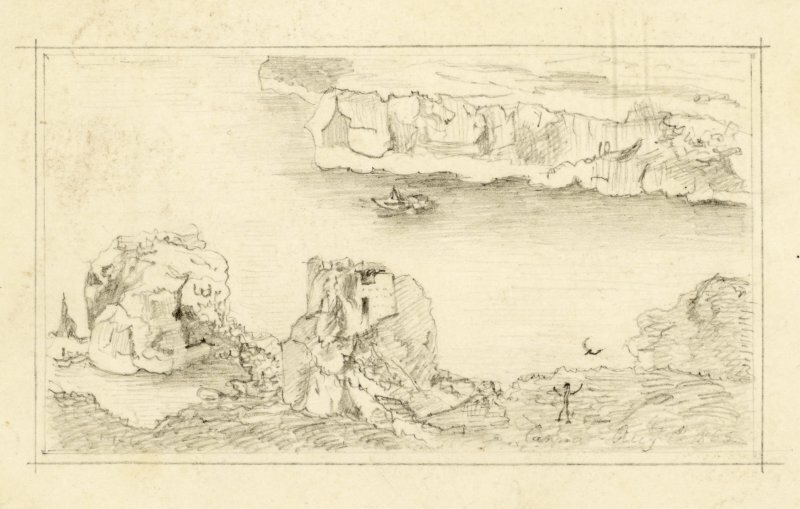 The crag was mentioned as a 'refuge' in 1577-95, but no building was referred to, so it may be assumed that the building is post-16th century (W G Collingwood 1906). 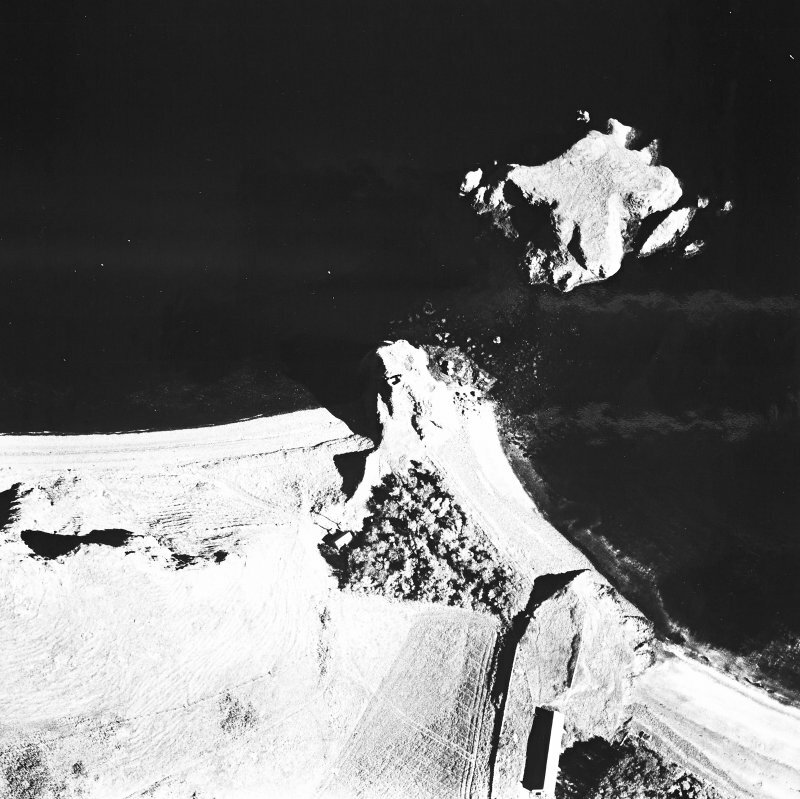 Appears to be a gatehouse added to a dun (OS 6"map, annotated A L F Rivet 20 June 1961). D Monro 1884; W Collingwood 1906; RCAHMS 1928. 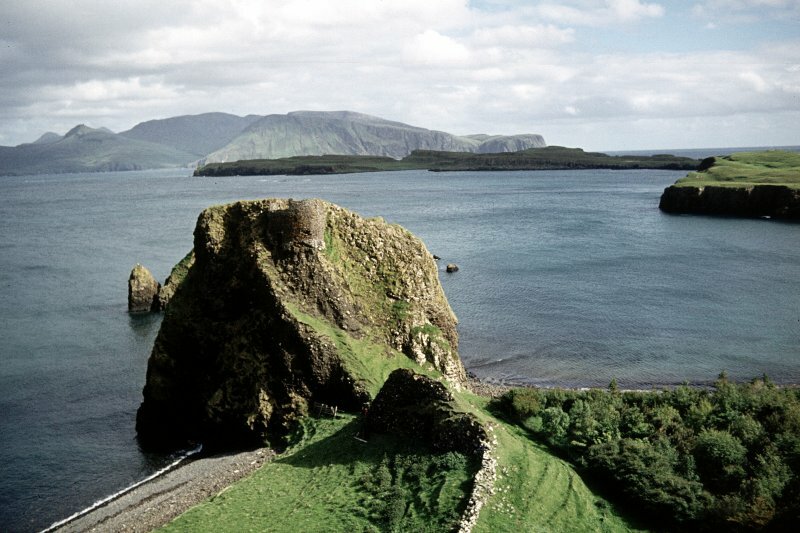 A small stronghold rather than a castle, built against the N-facing crag of Coroghon Mor. 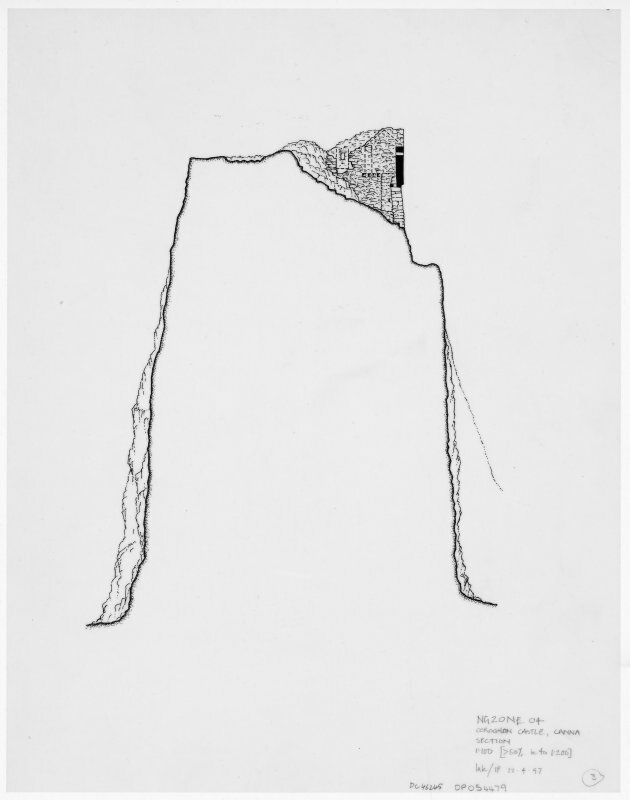 The building is an entity in itself and there is no trace of a dun as suggested by Rivet, nor of any other work. With walls generally 0.7m thick, the building is constructed of random masonry and utilises the rock face as part of its S and E walls. 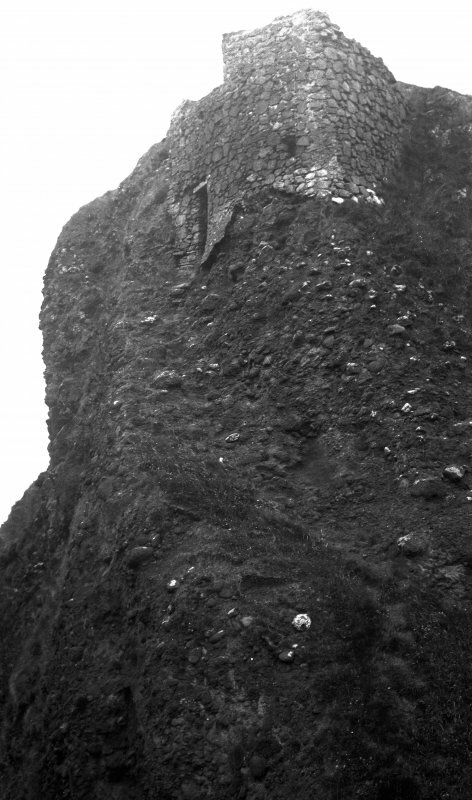 The high curving N wall is pierced near its E end by a doorway 0.6m wide at the head of a steep path up the crag. The main room occupies the W half of the castle and measures internally 3.0m N-S by 2.0m with a doorway 0.6m wide towards the S end of its E wall. Under it is a cellar of similar dimensions. 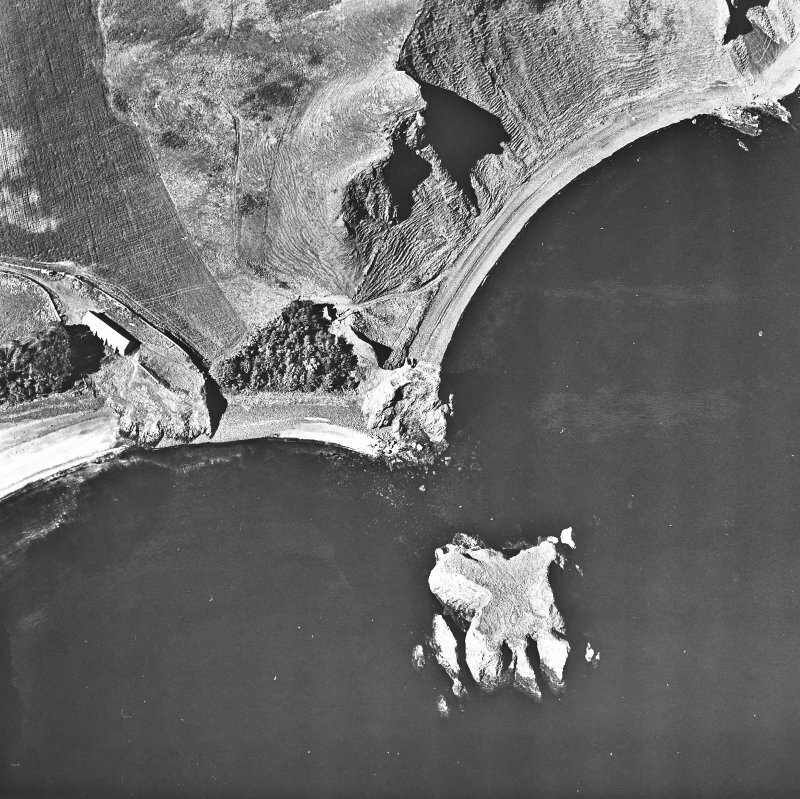 The 'basin' shown on Collingwood's plan is an apparently rock-cut hollow 3.5m x 2.0m by 0.3m deep, of uncertain purpose. The 'pit' is a natural hollow. 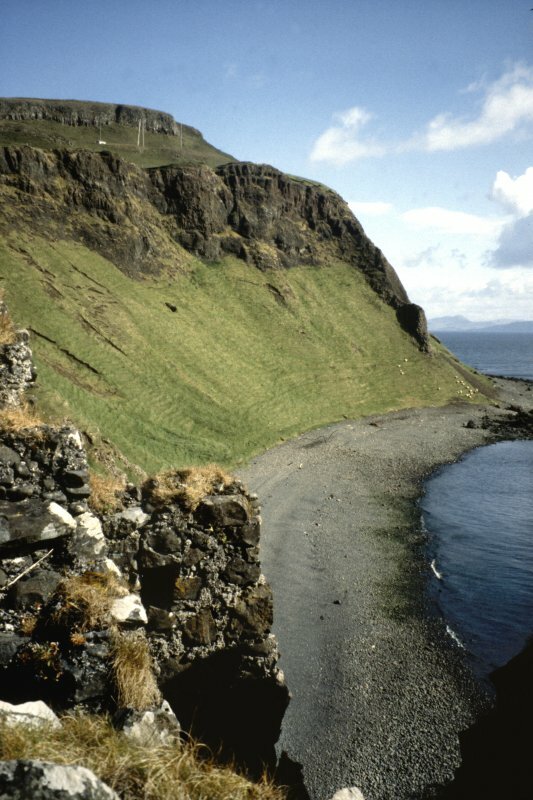 Campbell (Mr J L Campbell, Canna House) states that undecorated hand-made pottery sherds in his possession were found at the foot of the crag below the castle. 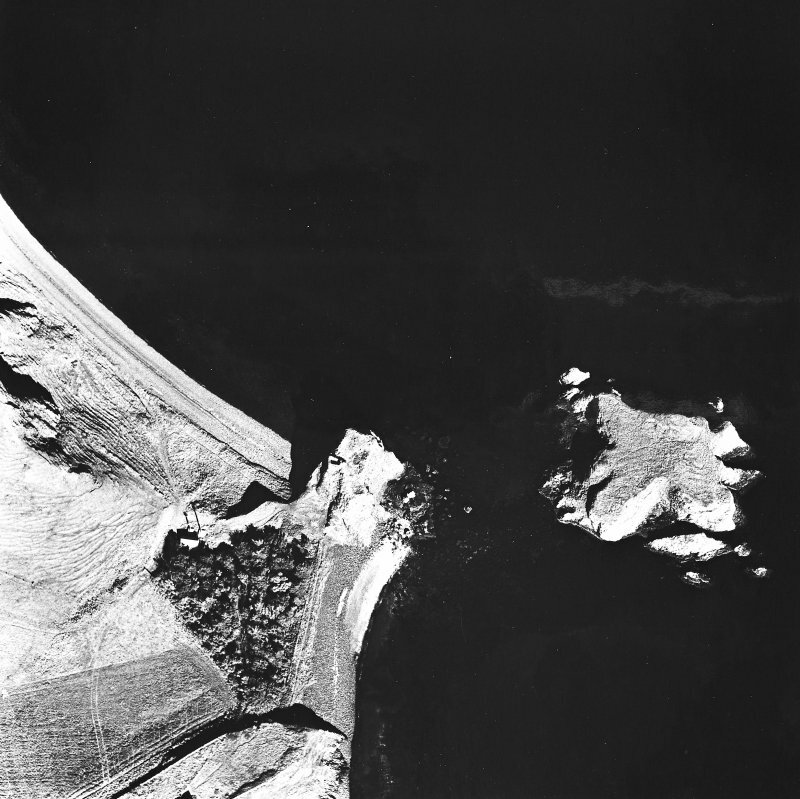 Visited by OS (A A), 1 June 1972. On the top of a rock stack, reached by a very steep path. Rubbly remains of a roughly rectangular small tower, probably of the 17th century. 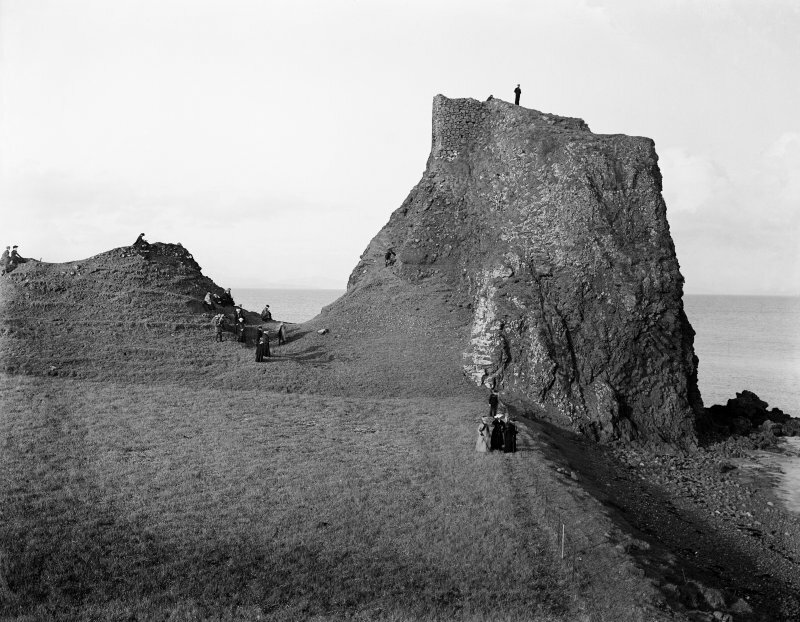 Coroghon Castle stands on top of a stack at the SE end of the cliffs which form the E end of Canna. 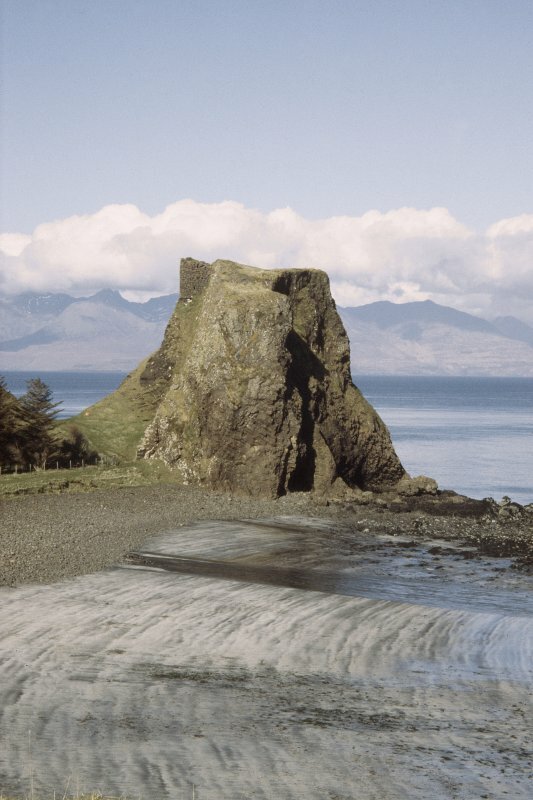 The stack juts out into the sea, and is accessible only by a steep path which ascends a narrow neck of land connecting it to the mainland. 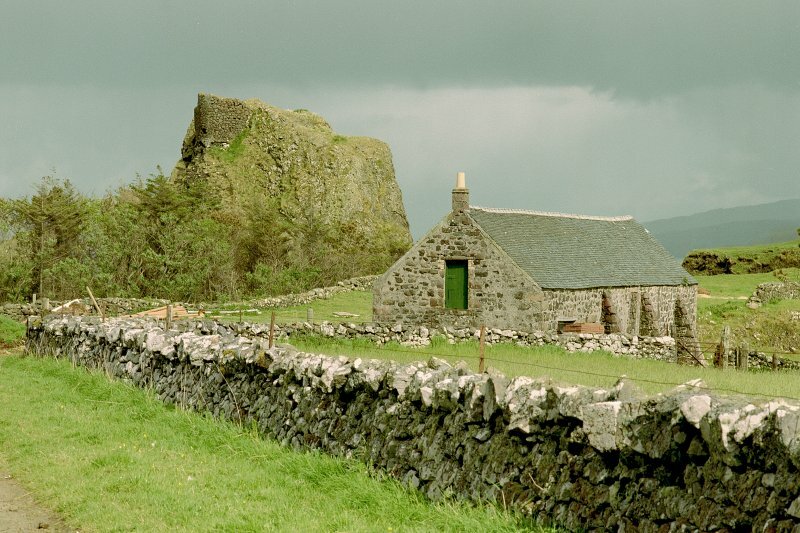 The castle is traditionally held to have been a prison, used in the late seventeenth century by a jealous husband to confine his wife; Campbell associates this tradition with Donald MacDonald of Clanranald and his wife Marion MacLeod. The castle is illustrated by Pennant at the end of the eigthteenth century; it is shown roofless, but still stands several metres in height. 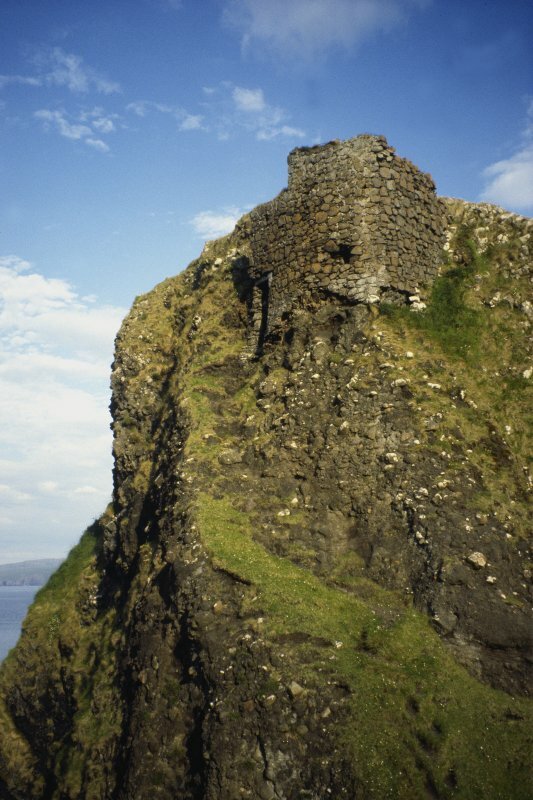 The surviving portion of the castle occupies the NW angle of the stack's summit, overlooking the approach from the mainland. Built of random rubble, natural rock-faces have been incorporated into its structure to form the walls of internal compartments. 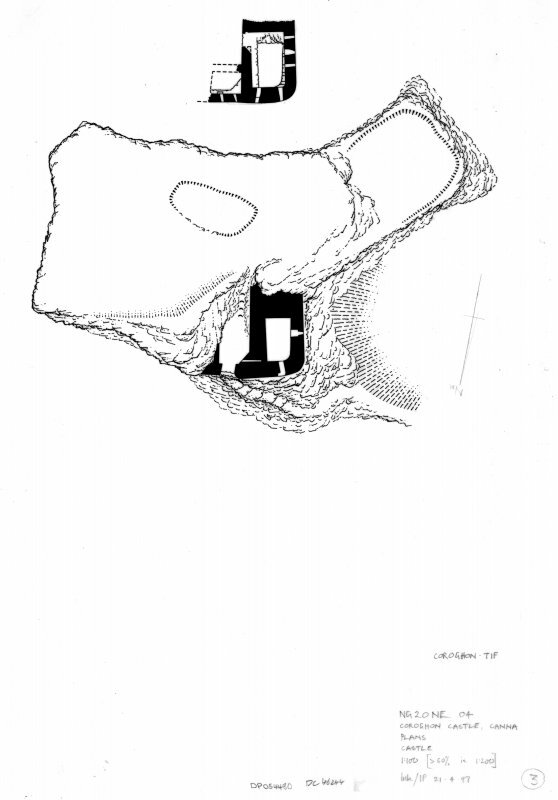 A narrow doorway with a dressed stone lintel in its N wall gave access to a small antechamber, and a bar-hole 1.1m deep is visible on its W side. To the rear of this antechamber, opposite the entrance, a series of four rock-cut steps provided access to the upper floor, which comprised two main rooms. 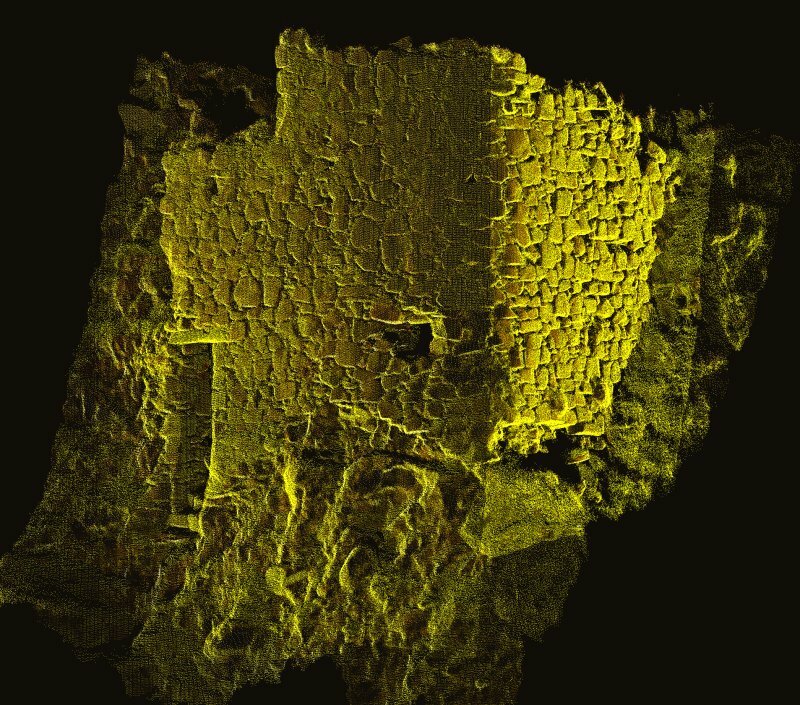 The first was directly above and was subdivided into two smaller chambers by a partition wall; at some stage, the northern of the two chambers appears to have been roofed independently, and traces of its pitched roof-line can still be seen on the E face of the main surviving internal wall. The second room on the upper floor, which is the larger, lies on the W and was entered by a gap at the S end of the main internal wall. 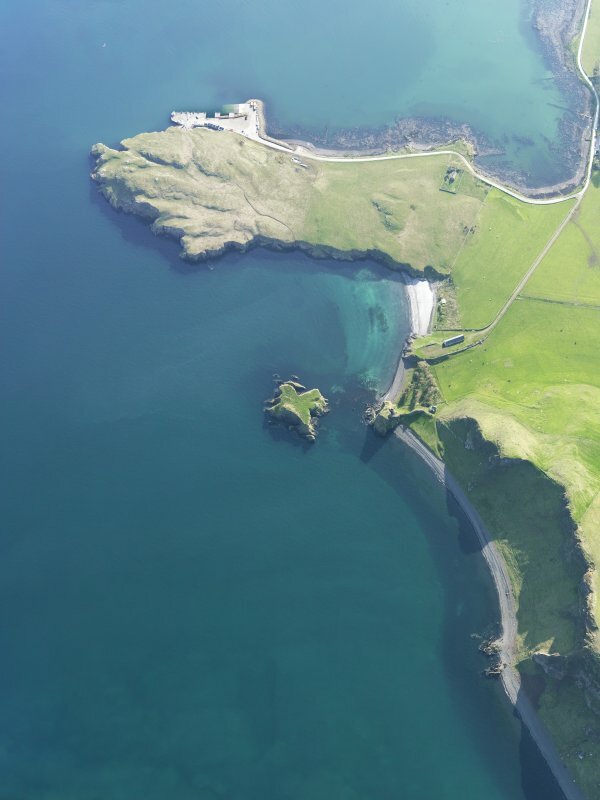 There are five narrow openings through its N and W walls, all of which are at slightly different heights. A cellar of narrower dimensions lies below this room and has two openings, one in the N wall and one in the W. It is unclear how access was gained to the cellar but it may have been by a trapdoor in the floor of the main upper room. 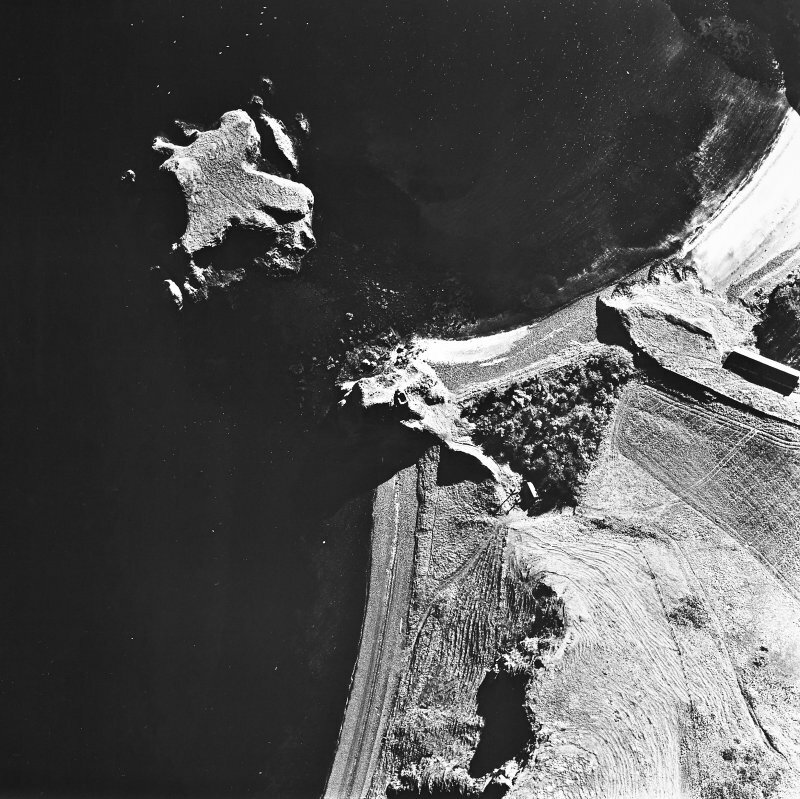 Little evidence of any other features are visible on the stack, but, given the presence of other forts and duns on the island, it is inconceivable that this impregnable position was not fortified at an earlier date. T Pennant 1790; J L Campbell 1984. Cf. 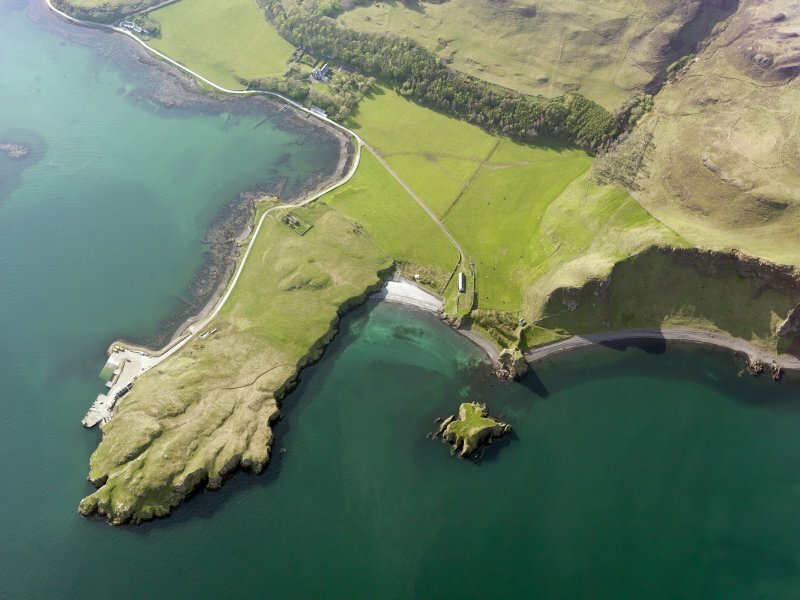 Description of the Isles of Scotland, c. 1577-95, given in Celtic Scotland, Skene, iii.,p. 434. 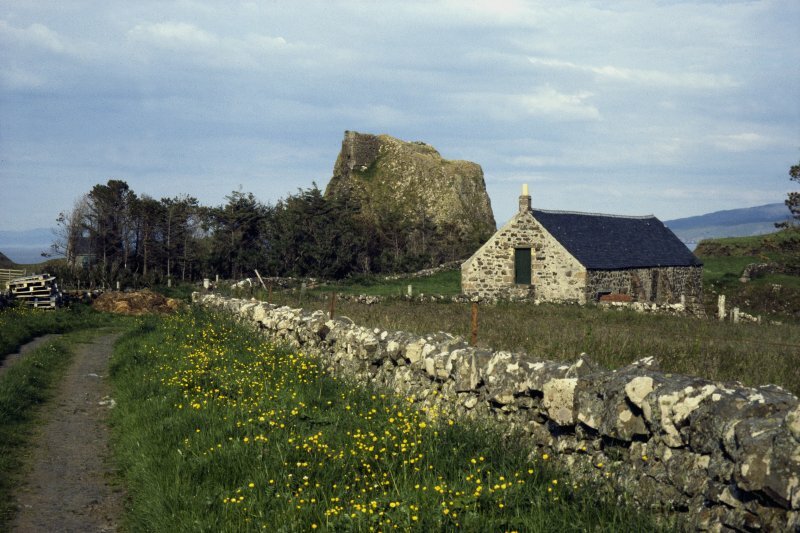 ThE} passage describes the "heich cra ig callit Corignan " as a refuge, but mentions no building ; t he existing structure is therefore subsequent to the end of the sixteenth century. 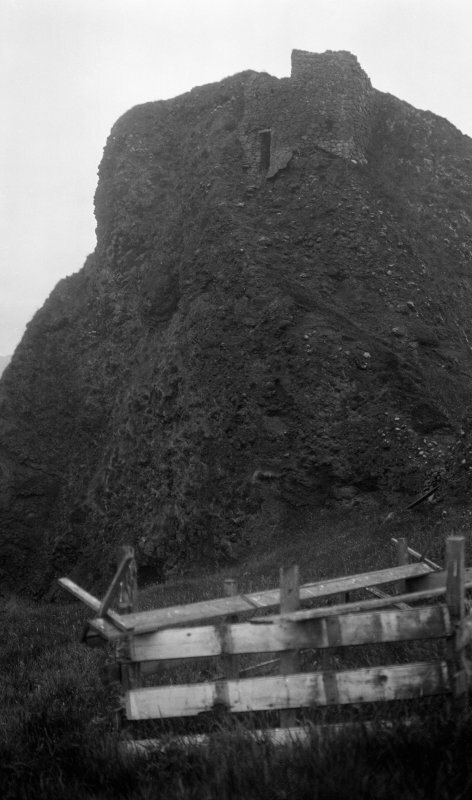 Visited by RCAHMS 6 July 1925.
structure that turned the stack into a well defended position.